Holy awesomeness! I want those bumpers!! "Glenda" 1984 SR5 4WD w/4AC engine swap, original hood ornament & inclinometer. Named after the good witch in Wizard of Oz, because she always gets you home safely. Ok guys here are some higher res version of a similar brochure! Sorry for bringing back an old thread. But would any of our European counter parts be kind enough to let us know the availability of the bumpers and the larger rims from salvage yards, etc. I would definitely like a set of the standard bumpers as well as the multi spoke 14 alloys. I'd also love a couple pairs of the fender flares. You can buy very similar looking wheels in the US, they are now an older style but I think still available. 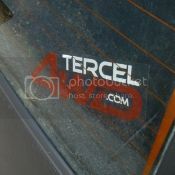 I have been longing for a set of Euro-bumpers from my Tercel ever since I owned my first one many years ago. I'd be happy to send some bumpers to you But I've been living in Italy for 4 months now. Have not seen one Tercel of any type on the road even in Turin which has plenty of small 4wd wagons around. I did see an AE95 all-trac corolla while motorcycling through Switzerland but generally there are very few cars over 10 years old. The odd VW beetle or Fiat 500 (early models) and some Type 3 Westfailure campers.. Also - postage is incredibly expensive! I sent some postcards back to Aus and the stamps for each one cost the same as 2 beers... can't imagine the price of bumper bars. Yeah I expect shipping would be horrible. But if we could get enough interest, maybe we could get shipping per item down to something palatable. yes, if we can fill a shipping container full of parts than it would be worth it. I thought it might be worth it to bring one of the AWD Yaris or other small cars in to USA. If I buy a totaled one here of the same year and than do a "major parts swap" (like all of the "parts" with the chassis ID on it), and than get it registered with a salvaged title. Than I can actually own one semi (sort-of) legally in the USA. True exchange rates can pose a problem. I guess the next step is to see if we can come up with enough interest and a reliable contact down under. okay mattel, SOLD! fill us a shipping container full of T4wd bumpers, composite headlights and the grills to go with it, inclinometers and T4wd transmissions, we can likely sell all that for a tidy profit including the shipping costs. Last I checked the AUS$ and US$ were pretty similar value. I second that. And fender flares too. I know i wany at least two pairs.